Five players scored for the top-ranked Skippers amid frigid temperatures on Lake Bemidji. For months now, Minnetonka has moved about with a giant target on the back of its blue and white sweaters. Success and defending a state championship will do that. So the business-like and methodical approach the Skippers’ wielded to persevere through the challenges associated with Hockey Day Minnesota, while systematically picking apart another team of superb skill, should surprise no one. The Skippers, unbeaten and ranked all season at No. 1 in the Class 2A coaches’ poll, brushed aside the distractions, the media spotlight, the choppy ice conditions and an air-temperature of 15-below at puck drop to roll past No. 2-2A Andover 5-2 Saturday morning near the southern shore of Lake Bemidji. The Hockey Day Minnesota victory, no matter how many people noticed, is just the latest for a Minnetonka (17-0-1, 1-0-0) team committed now only to improving. Minnetonka broke through with three goals in the final period to pull away from a previously unbeaten Andover team that brings high-end talent and balance. Five different Skippers finished on the goal sheet as Minnetonka simply wore down Andover with its incredible depth. After a sloppy first period in which the players on both sides learned how to better handle a bouncing puck, neither side side too terribly disturbed by the conditions of the outside game. Andover struck first on a short-handed goal by senior Nick Dainty, fed by Charlie Schoen, before Minnetonka answered less than a minute later with a power-play goal by Will Crull to pull the Skippers even. In the second period, Minnetonka took the lead with another power-play goal, this time from senior captain Grant Docter, and the Skippers never trailed again. The Skippers were committed to moving the puck in the most direct way afforded, and it began to click. Once the Skippers got a handle on their ability to pass and move the puck, their transition and attack began to bloom. Puck movement and depth soon paid dividends for Minnetonka. 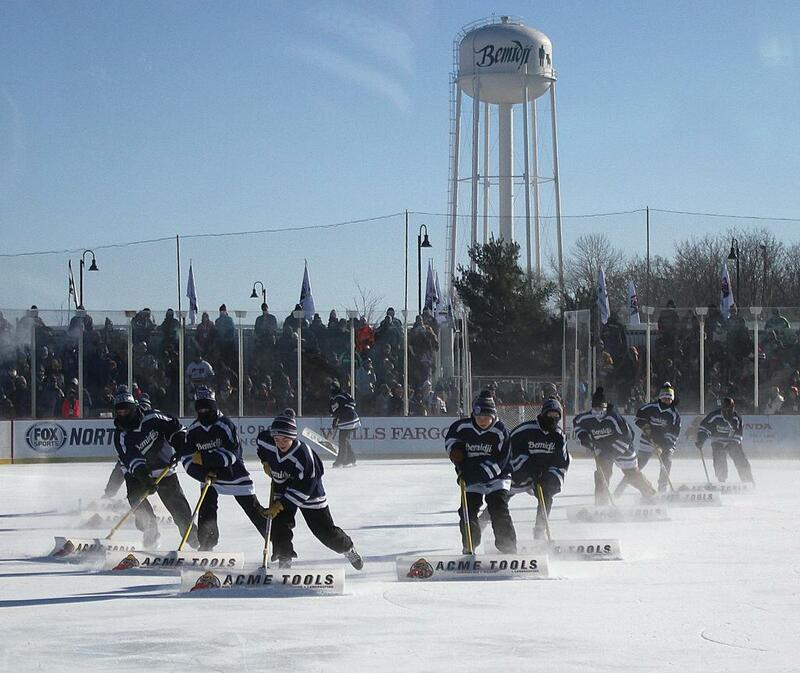 Minnetonka was 2-for-3 with the man advantage, while killing the only penalty issued its way. Andover suffered its first loss of the season, and now looks to learn from it and apply the lesson moving forward. Minnetonka erstwhile will celebrate this one only about as long as the four-hour bus trip takes to head south to the Twin Cities. The Skippers know much more lay ahead. 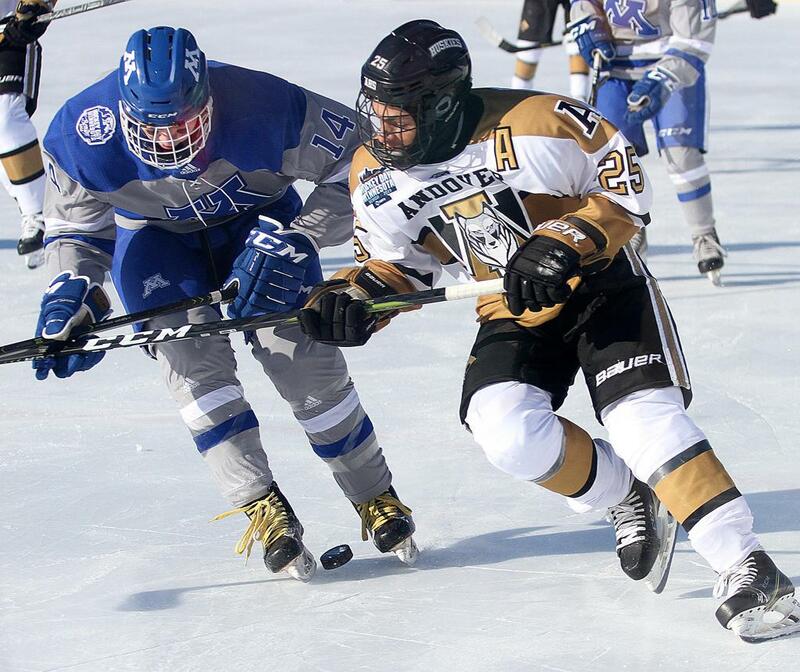 Minnetonka broke through with three goals in the third period to fend off Andover 5-2 Saturday morning amid subzero temperatures on the shore of Lake Bemidji at Hockey Day Minnesota. Defending state champion Minnetonka, ranked No. 1 in the Class 2A coaches' poll, had five different players finish on the scoring sheet as the Skippers wore down No. 2-2A ranked Andover. Temperatures hovered about 15-below at puck drop, but after a sloppy first period in which the players learned how to better handle a bouncing puck, neither side seemed too terribly disturbed by the conditions of the outside game. After Andover (16-1-1, 6-0-1) struck first on a short-handed goal by senior Nick Dainty, fed by Charlie Schoen, Minnetonka (17-0-1, 1-0-0) answered less than a minute later with a power-play goal by Will Crull to pull the Skippers even. In the second period, Minnetonka took the lead with another power-play goal, this time from senior captain Grant Docter. The Skippers never trailed again. Senior goaltender Charlie Glockner proved tough between the pipes for the Skippers, blocking 26 of 28 shots.